Spinal Tap made its mark as one of England's loudest bands, releasing slightly above average records like Shark Sandwich. 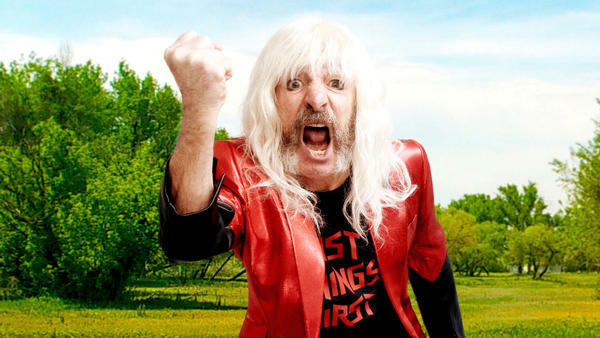 Now, Derek Smalls, the band's legendary bassist, is making waves of his on his own with a new reflective solo record in the vain of David Bowie's Blackstar and Leonard Cohen's You Want It Darker. It's called Smalls Change (Meditations Upon Ageing) and features some of the rock legends that Smalls has befriended over the years including Dweezil Zappa, David Crosby and Donald Fagan to name a few. In doing my research, I came across several articles that refer to Spinal Tap as a fictional band. How can that be?! I've got the ticket stubs and CD's to prove otherwise. I work with some of the sharpest minds in broadcasting but why would my NPR producer put a disclaimer at the top of my prep sheet that said and I quote, "Note: Derek Smalls is a fictional character played by Harry Shearer in the 1984 film This Is Spinal Tap, a parody film." That producer must not be familiar with the term documentary. In any case, we'll talk to smalls about said documentary, which famously shows the band unable to find the stage. That and more in this session. Listen in the player above.